This is the secret Lake District of the Caldbeck Fells - John Peel country - an area that sees few visitors, yet its wild and beautiful fells offer superb walking with panoramic views of the Scottish hills across the Solway estuary, as well as the familiar peaks of Central Lakeland observed from a unique vantage. We provide details and maps for several walk options from easy to challenging. Centred on the traditional villages of Hesket Newmarket and Uldale the walks vary from wanders along quiet bridleways and country lanes, taking in local pubs along the way, to ascents of the main Caldbeck Fells of Carrock, High Pike, Knott, Great Sca Fell and Great Cockup. Be different and visit the lesser known ‘Secret Lake District’ of the Calbeck Fells. 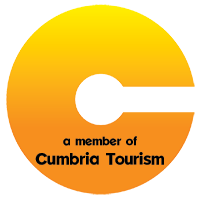 Arriving at your base in the Caldbeck Fells, you check into your comfortable accommodation and can explore the local area using our detailed information pack. Option A (easy): The pretty Whelpo Beck, a limestone gorge known as the 'Howk', an ancient bobbin mill, the church and hidden well of St Kentigern, and 'Waters Meet', are all features of this walk which includes a pleasnt lunctime stop at a pub or tea room. 5 miles. 700ft. ascent. Option B (moderate): It used to be said that “Caldbeck and the Caldbeck Fells are worth all England else”, a reference to the mineral wealth of these hills. this low level circuit explores the fascinating mining heritage of this hidden corner of the Lake District, walking bridleways and farm tracks across the Caldbeck Fells. 8 miles. 1200ft. Option C (hard): An ascent of Carrock and High Pike, the two fells most closely associated with Hesket Newmarket and Caldbeck villages. Tremendous views across the Solway estuary to Scotland. 10 miles. 2370ft. Option A (moderate): A low level walk through unspoilt rural Lakeland following quiet country lanes, bridleways and footpaths, through the villages and farmsteads of Fellside, Branthwaite and Longlands. 7 miles. Option B (hard): A challenging walk across two high fells with tremendous panoramas north to Scotland and south to the mountains of Central Lakeland. 10 miles. 2370ft. Option A (easy):. An easy stroll along the country lanes around Uldale across Aughertree Fell and a lunch break at Emily’s Black Lion pub in the village of Ireby before returning to base. 5 miles. Option B (moderate): A walk around Overwater, one of the least known of the lakes and return via the hamlet of Orthwaite. 6 miles. Option C (hard): An ascent of Uldale’s local fell, Great Cockup via the ridge of Trusmadoor and descent via Brocklecrag 8½ miles. 1880ft. Option D (hard): An ascent of Knott, the highest peak of the Caldbeck Fells. This excellent circuit ascends via Charleton Gill and great Sca Fell fell and descends via Burn Todd and Orthwaite. 10 miles. 2370ft. A Wandering Aengus information pack containing all necessary maps, a current guide book or our own weather-proof route cards and our own weather-proof 'info cards' with local information - including locations and opening times of cafes, pubs, shops etc. Breakfast at your accommodation is included in the holiday price. In most cases your accommodation will serve dinner and will be able to prepare a packed lunch for you. Sometimes this will have to be arranged in advance and we will let you know if this is the case. Alternatively you can use our detailed notes to make your own dining and lunch arrangements using local restaurants. The nearest railway station to Caldbeck/Hesket and Uldale is at Penrith (30 minutes) which is on the main North-West rail link between London and Glasgow. We can arrange a taxi for you on request (approximately £35). If you are arriving by car we can also arrange a transfer back to your car from Uldale. On this holiday we use two different bases for walks at Caldbeck/Hesket Newmarket and Uldale. You can choose to spend 2 or 3 nights in a single base or up to 6 nights in two bases with luggage transfer between the two. 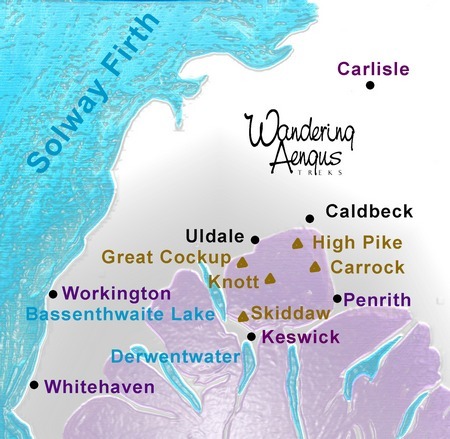 We provide various walk options for each day ranging from relatively easy or moderate walking, to strenuous hikes taking in the Wainwright summits of the area. On the day where you walk from one base to the next, there are also route choices which will include at least one moderate option. You can mix and match the options to make your holiday as easy or as challenging as you like.